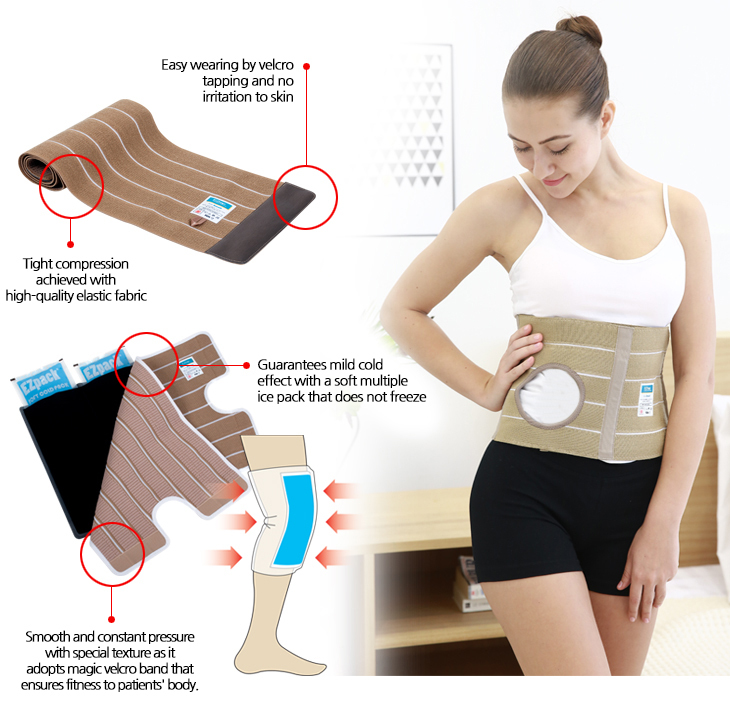 A variety of EZ-rap products which Doctor Supply produces provide exceptional effects in preventing discharge, blister after various kinds of surgery and reducing pain and edema. Particularly, products of EZ-rap prevent the rupture of a wound with intra-abdominal pressure and enable patients to resume walking earlier, having shown supreme effects in preventing post-operative lung-complications, intestinal adhesions, or abdominal hernia. ▪ Prevents blisters around sites without tapping for dressing purpose. ▪ Significant reduction of treatment time without extra elastic bandage. ▪ Provides parallel pain treatment with cold therapy function. ▪ Capable of treating edema with compression. ▪ Saves time and cost with convenient treatment through easy wearing.